History of the surname Ellis. The first recorded spelling of the family name anywhere in the world, is believed to be that of William Elyas, which was dated 1200, in the tax returns for the county of Yorkshire. I do have the descendancy tree from Richard to present day which I am putting onto my computer to give to my friends. I will happily pass on to other Ellis descendants if they approach you. Re the living descendants I know I would have to ask permission first to add their information . Some of Richard’s family have ended up in Somerset. There are a few Ellis ancestors born in Masham but not a Richard born around his time so feel confident to add in Richard’s note about possible parents. Also at least one of the Grewelthorpe Ellis family has put his birth as Masham on later censuses so there appears to be a close connection with both villages and this family. If you wish to contact Wendy please contact the site. Details of the Ellis family with Grewelthorpe connections. ALFRED ELLIS. Bap. 28.4.1865 Grewelthorpe. Son of Thomas & Ann. Farmer of Bramley Grewelthorpe. ALICE JANE ELLIS. of Kirkby Malzeard. Report in Times newspaper 1965.
she left £34,919 gross. She left money for Methodist church purposes, £250 to Park St. Masham Methodist church, the residue divided between the Methodist Home for the aged and the National Children’s home. ANN ELLIS.[nee?] Born C 1799 Kirkby Malzeard. Married to Thomas Ellis of K.Malzeard. ANN ELLIS. Born 1804. Masham. Buried17.11.1883. M.I. Grewelthorpe. Sister of Jane Blackburn. ANN ELLIS. Born C. 1819 Trent Bridge. Wife of Joseph the Tailor from Masham. ANN ELLIS. Born 1826 Buried 7.9.1865 Grewelthorpe. Lived Bramley. ANN ELLIS [nee Burton]. Born C. 1836 Grewelthorpe. Dau of Henry Burton. [Shoemaker] & Mary Ascough. Wife of Thomas of Galphay. Married on 22.5.1866 Kirkby Malzeard church. ANN ELLIS. Born C. 1839 Masham. Dau of Robert & Mary Calvert. ANNE ELLIS. Born C. 1847 Hutton. Dau of Richard & Sarah. ANNIE ELLIS. Born C. 1873 Masham. Dau of William J [stonemason] & Isabella Lofthouse. Living Masham 1881. ANNIE ELLIS. Born 1880 Kirkby Malzeard. Dau of John & Jane. ANNIE ELLIS. Born C. 1897 Kirkby Malzeard. Dau of John Robert & Mary Proctor. [b.1866]. ANNIE ELLIS. Born C. 1906 Masham. Dau of Silvester & Sarah Mary Coates. ARTHUR ELLIS. Born 19 June 1882. Died March 1953 age 71. Kirkby Malzeard. Youngest son of John & Jane Dearlove. of Ashfield House, Kirkby Malzeard. Arthur was a dairy farmer. Married to Beatrice [born 1893]. Living Rock Wood Kirkby Malzeard in 1939. BENJAMIN L. ELLIS. Born 29 Dec.1866 East Witton. Son of William J [stonemason] and * Lofthouse. * Living Masham 1881. Married Ellen [born 1871]. A retired dairy farmer at Ewemire House Low Ellington in 1939. CAMERON JAMES ELLIS. born C. 1904 Masham. Son of Silvester & Sarah Mary Coates. DEARLOVE ELLIS. Born 3 Feb 1877 Died October 1954. Kirkby Malzeard. Son of John & Jane Dearlove.. Lived Ashfield House, Kirkby Malzeard. He was a farmer and cattle dealer. He married Alice J. Verity [born 19.5.1886] in 1915. Report in Yorkshire Post. Oct 1954. Well known in the North as a judge of cattle. Mr Dearlove Ellis of Ashfield Hse. K.Malzeard has died suddenly when visiting a farm in Swaledale. He was 77. Mr Ellis who is a dealer, was selecting sheep to buy, when he collapsed in a field. Son of the late Mr. John Ellis he succeeded his Father in the business and at the farm. A past chairman of the Parish Council and Past President of the village Hall, he was a member of the Ebenezer Methodist Church. On Saturday he was present during the decoration of the church for the harvest festival, and attended both Sunday services. He leaves a widow. EDWIN SIMON ELLIS. Born 4 April 1902. Masham. Died 1997 Grewelthorpe. Son of Silvester & Sarah Mary Coates. Married Doris Coldbeck. [born 1905] in 1931. see Coldbeck page. Lived 4 Lake Terrace, Grewelthorpe. See photo at end. ELIZA ELLIS. Born C1844 Leyburn. Dau of Robert & Mary Calvert. ELSIE ELLIS nee LEDGER. Born Bawtry. Wife of Robert the station master. Lived Follifoot. ELSIE G. ELLIS. Born 1886 Leeds.Dau of Robert [station master] & Elsie Ledger. ELIZABETH ELLIS. Born 1774 Burneston. Dau of James. Married in 1798 to Simeon Pearson of Kirkby Malzeard. ELIZABETH ELLIS. Married on 3.4.1798 at Kirkby Malzeard to Simon Barker. a weaver. ELIZABETH ELLIS. Dau of Robert of Hill Top. Married on 8.12.1838 at Kirkby Malzeard to Thomas Peacock. a brickmaker of Hunslet. Son of William. ELIZABETH ANN ELLIS. Born 1849 Kirkby Malzeard. Dau of John & Ann. ELIZABETH J. ELLIS. Born C. 1850 Leyburn. Dau of Robert & Mary Calvert. ERNEST ELLIS. Born 18.1.1929. Bap. 10.2.1929. Son of Fred Percy & Selina of Laverton. ESTHER ELLIS. Born C1812 Grewelthorpe. Buried 7.4.1813 Kirkby Malzeard. ESTHER ELLIS. Born 1838 Kirkby Malzeard. Died Jan 1904. Dau of John & Mary. Married Henry Thwaites of Kirkby Malzeard. Living Grewelthorpe in 1881. Dau of Robert & Mary Calvert. Wife of GRIFFITHS. Had dau Eliza Griffiths. b.1867 in Durham. ETHEL ELLIS. Born 1884 Kirkby Malzeard. Dau of John & Jane Dearlove. EVA ELLIS. Born 1875 Kirkby Malzeard. Dau of John & Jane Dearlove. EVELYN ELLIS. Born 26 Sept. 1905. Dau of Thomas & Annie of Ellington. Member of the WVS in 1939. Later married ? Verity. FLORRIE ELLIS. Born C.1892 Kirkby Malzeard. Dau John Robert & Mary Proctor. [b.1866]. Married David Richmond. in 1914. Died in 1958 in Kirkby Malzeard. FRANK ELLIS. Born 19 March 1920. Unmarried in 1939 an Income Tax officer in Ripon. FREDERICK ELLIS. Born 24 Jan1893. Horseman at Firth Hse Farm Low Ellington in 1939. FRED PERCY ELLIS. Born 4 Jan 1899. Married to Selina Alice [Born 1905]. Dairy farmer at South View Laverton in 1939. FRITZ WILLIAM ELLIS. Born 24 Sept 1864. Widower retired living Low Laithe in 1939. GEORGE WILLIAM ELLIS. Born 1885 Grewelthorpe. Grandson of Matthew & Mary Ann Ellis of Wincobank, Ecclesfield. Matthew was a Cutler. [steel fork maker]. GEORGE ELLIS. Born 1 Aug 1893. Married to Annie [born 1895]. He was a transport organiser in WW2. A haulage contractor in Ripon in 1939. GEORGE W. ELLIS. Born 16 Feb. 1933. Son of George [Haulage cont. ]& Annie. HAROLD ELLIS. Born 16 May 1917. Son of Tom [sheep farmer] & Edith. HERBERT ELLIS. Born 13 April 1888 Laverton. Son of Robert & Margaret. Dairy Farmer. Married to Margaret born 1880. Living Warren Lane Galphay in 1939. ISABELLA ELLIS. Born C. 1847 Leyburn. Dau of Robert & Mary Calvert. JAMES INGRAM ELLIS. Born C1855 Kirkby Malzeard. Married Mary Spence. of K.Malzeard. JAMES ELLIS. Born C. 1869 Carlton. Son of William J [stonemason] & Isabella Lofthouse. James a woodman living Masham 1891. JAMES W. ELLIS. Born 16 March 1906. Son of Benjamin & Ellen. Horseman at Ewemire Farm Low Ellington. in 1939. JANE ELLIS. Born C. 1849. Dau of John the Butcher & Mary. Kirkby Malzeard. Married on 11.1.1877 at Kirby Malzeard church to Leonard Umpleby. Butcher from Cheetham, Manchester. [b.1851] son of Leonard Umpeby. JANE ANN ELLIS. Born C. 1868 K.Malzeard. Dau of Thomas & Ann. Married John Corus. of Horskham. JANE ELLIS. Born C1868 Kirkby Malzeard. Dau of John & Jane Dearlove. JOHN ELLIS. Born C1802. Died 1864. Buried Kirkby Malzeard. M.I. Married to Mary b.C1813. d.1869. Buried Kirkby Malzeard. M.I. JOHN ELLIS. Born C. 1838. Buried 6.1.1840 Kirkby Malzeard. JOHN ROBERT ELLIS. Born 1864 Kirkby Malzeard. Son of John & Jane Dearlove married Mary Proctor in 1891. JOHN ELLIS. Bap. 5.6.1870 Grewelthorpe. Buried 30.3.1871. Grewelthorpe. Son of Thomas & Anne. JOHN ELLIS. Born 1871 Masham. Son of William [stonemason] & Isabella Lofthouse.. A Tailor’s apprentice in Masham 1891. JOHN H. ELLIS. Born C. 1887 Laverton. Son of Robert & Margaret. JOHN ELLIS. Born C. 1895 Kirkby Malzeard. Son John Robert & Mary Proctor. [b.1866]. JOHN ELLIS. Born 10 Sept.1909. Son of Benjamin & Ellen. Dairy farmer. unmarried in 1939. JOHN R. ELLIS. Born 30.3.1925. Son of Lawrence & Alice. JOSEPH ELLIS. Born C. 1820 Masham. Tailor husband of Ann of Trent Bridge. Living Pannal Harrogate 1891. JUNE E. ELLIS. Born 15 July 1904. Dau of Benjamin & Ellen. Unmarried in 1939. LAWRENCE ELLIS. Born 9 July 1895 Kirkby Malzeard. Son of John Robert & Mary Proctor. Farmer & Cattle dealer married to Alice. [born 1893]. LAVINIA ELLIS. Born C1867 Kirkby Malzeard. Dau of Richard [butcher] & Martha. MABEL ELLIS. Born 1882 Leeds. Dau of Robert the station master & Elsie Ledger. MARGARET ELLIS. Born 1819 Laverton. Dau of Robert of Galphay. She married William Allan. son of Richard Allan of Laverton, on 12.12.1842 at Kirkby Malzeard. MARGARET ELLiS. Born C 1853 Leyburn. Dau of Robert & Mary Calvert. MARIA ELLIS. Bap. 18.8.1850 Kirkby Malzeard. Dau of John [The Butcher] & Mary. Married on 28.4.1877 at Kirkby Malzeard church to Joseph Pearson. [b.1852] son of Thomas Pearson. MARTHA ELLIS.[NEE?]. Born 2 June 1857. A widow living Rustic Cottage Kirkby Malzeard in 1939 with her dau. Mary. MARY ELLIS [nee ?]. Born C1813. Died 1869. Wife of John Ellis. Both buried Kirkby Malzeard. M.I. MARY ELLIS. Born C1815 Kirkby Malzeard. Married Jonah Milner. MARY ELLIS [nee CALVERT.] Born C. 1815 Redmire. Died 1871 Leyburn. Wife of Robert [Maltster]of Grewelthorpe. MARY ELLIS. Born 1826. Died 1908 Kirkby Malzeard. Dau of Thomas of Bagwith. Married William Calvert. son of George Calvert. of Carlsmoor. on 28.12.1848 at Kirkby Malzeard church. MARY ELLIS. Born Oct 1841. Leyburn. Dau of Robert & Mary Calvert. MARY ELLIS. Born C. 1843 dau of John the Butcher, Kirkby Malzeard. Married on 24.4.1869 at Kirkby Malzeard church to George Thwaites. Stonemason. [b.1846] son of John Thwaites. stonemason. MARY ELLIS. Born C. 1866 Pateley Bridge. A Widow in 1911 living Yew Tree House, Kirkby Malzeard. She had 5 children. MARY ELLIS. Born 1871 Kirkby Malzeard. Dau of John & Jane Dearlove. MARY PRATT ELLIS. Born C 1874. Lived Kirkby Malzeard. Died 21.10.1918. In Ripon workhouse. Buried 28.10.1918. She was a spastic paraplegic. MARY JANE ELLIS. Born 28 Feb 1883. Kirkby Malzeard. Dau of Richard [butcher] & Martha. Unmarried in 1939. MARY ELLIS. Born C1893. Kirkby Malzeard. Dau of John Robert & Mary Proctor.[b.1866]. MATTHEW ELLIS. Born C.1857 son of Thomas. Matthew was a Wholesale grocer in Leeds when he married Sarah Skelton Dobson. at Kirkby Malzeard church on 22.9.1883. She was born 1858 dau of Christopher Dobson. of Kirby Malzeard. MINNIE ELLIS. Born 25 March 1918. Living Leighton Hall Healey in 1939. MOSES ELLIS. Born 1st April 1878. Married to Annie [born 1865]. Disabled living Healey in 1939. 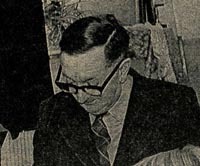 PERCY ELLIS. Born C 1888 Leeds. Son of Robert [Station master] and Elsie Ledger. RICHARD ELLIS. Born C. 1813 Grewelthorpe.Died 1852. Ag. Lab. Husband of Sarah Teasdale of Kirkby Malzeard. Living Bells Yard, Allhallowgate, Ripon in 1851. They had a son William. RICHARD ELLIS. Born C. 1840. Son of John [Butcher] Kirkby Malzeard.& Mary. Married on 9.6.1866 at Kirkby Malzeard church to Maria Frankland. [b.1843] dau of William Frankland. Coachman. RICHARD ALEXANDER ELLIS. Born and died 1850. Leyburn. Son of Robert & Mary Calvert. ROBERT ELLIS. Born C. 1778. Lived Galphay Moor. Died 22.12.1844 age 66. ROBERT ELLIS. Born C. 1810 Grewelthorpe. died 1883. Husband of Mary Calvert. of Redmire. 1851 a Malster.with 5 children. After 1861 a gardener in Railway St. Leyburn. ROBERT ELLIS. Bap.7.9.1844 Dallowgill. Son of Robert & Jane. Lived Belford, Kirkby Malzeard. ROBERT ELLIS. Born C1847 Kirkby Malzeard. Son of George & Ann. Married in 1876 to Jane Ann Pratt. of Borrowby. ROBERT ELLIS. Born C. 1858. Son of Robert & Mary Calvert. Railway station master. After 1891 living at Station House, Follifoot. Yorkshire. Husband of Elsie Ledger. of Bawtry. They married in 1881 in Leeds. ROBERT ELLIS. Born 2 Oct 1860 Kirkby Malzeard. Stonemason. Married to Margaret [born 1861] of Laverton. ROBERT A. ELLIS. Born C1864 East Witton. Son of William J [stonemason] & Isabella Lofthouse. In 1881 he was a pupil teacher at Masham school. ROWLAND ELLIS. Born C. 1892 Pannal. Son of Robert [station master] and Elsie Ledger. RUTH ELLIS. Born & died 1850 Leyburn. Dau of Robert & Mary Calvert. RUTH ELLIS. Born C. 1865 East Witton. Dau of William J. [stonemason] & Isabella Lofthouse. In Masham 1881. SARAH ELLIS. Born C. 1814 Kirkby Malzeard. Wife of Richard. SARAH ELLIS. Born 1856 Kirkby Malzeard. Dau of John & Ann. SELINA ELLIS. C1866 Kirkby Malzeard. Dau of John & Jane Dearlove. SILVESTER ELLIS. Born C. 1881 Masham. Son of William J [stonemason] & Isabella Lofthouse. Married Sarah Mary Coates. of Arkengarthdale in 1902. Lived Masham. THOMAS ELLIS. Born C 1799 Kirkby Malzeard. Married Ann. THOMAS ELLIS. Born C, 1811 Roomer. Grewelthorpe. THOMAS ELLIS. Born C. 1828 Galphay. Married on 22.5.1866 Kirkby Malzeard church to Ann Burton of Grewelthorpe. Thomas was a Husbandman & Fellmonger living Gewelthorpe 1871. See Burton page. THOMAS ELLIS. Son of William a Butcher in Norton Conyers. Married Mary I’Anson. dau of John of Kirkby Malzeard. on 16.12.1844 at Kirkby Malzeard. Witnesses Robert & Ann Frankland. THOMAS ELLIS. Born C 1844 Kirkby Malzeard. son of Richard & Sarah. Moved to Somerset in 1891. THOMAS HENRY ELLIS. Born c. 1855. Leyburn. Son of Robert & Mary Calvert. THOMAS ELLIS. Born 8 Oct. 1874. Married to Annie [born 1879]. Farmer at Ruskill Farm Ellington in 1939. Listed as an ARP Warden in 1939. THOMAS ELLIS. Born 1875 Kirkby Malzeard. Son of John & Jane Dearlove. THOMAS ELLIS. Born C. 1875 Masham. Son of William J [stonemason] & Isabella Lofthouse. Painter’s apprentice in Masham 1891. THOMAS [TOM] ELLIS. Born 15 May 1895. Married to Edith [born 1896]. Sheep and dairy farmer at Firs Farm Healey in 1939. He was also a special constable during the war. VINCENT C.ELLIS. Born 17 July 1914. Son of Thomas & Annie of Ellington. Cowman at Ruskill Farm Ellington. WILLIAM ELLIS. Born C.1837 Leeds. Stonemason. Lived Masham From 1871. Husband of Isabella E. Lofthouse. of Coverdale. WILLIAM ELLIS. Born C1841 Swinton. Son of Richard & Sarah. WILLISON ELLIS. Born C. 1877 Masham. Son of William [stonemason] & Isabella. Mason’s apprentice in Masham 1891. WILLIAM ELLIS. Born C. 1891 Kirkby Malzeard. Son of Robert & Margaret. WILSON ELLIS. Born C. 1877 Masham. Son of William J [stonemason] & Isabella Lofthouse. Edwin [Eddy] Ellis of Grewelthorpe in 1976. Report in Northern Echo August 1897.